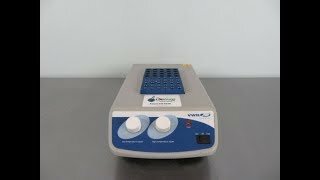 The VWR heating block are used to incubate samples for the lifescience community. Heat block system include both high and low temperature controls along with aluminum test tube blocks and has a temperature range up to 150°C (302°F). The VWR Heat Analog Heatblock comes with red LED light which illuminates while in use to alert the user when system is heating. This incubator holds two interchangeable aluminum heating blocks with wells for an external temperature probe. Dimensions (W x D x H) 8" x 14" x 3"
This used lab equipment listing is for a gently used VWR heatblock system. Instrument was tested at multiple temperature setpoints and is in perfect working condition. Heat block is ready to ship with a 1-2 day turnaround time. Please use the contact form, or give us a call at 617-999-5746 with any questions.